This chapter is written as one method to supply the necessary support systems for educational and training design. 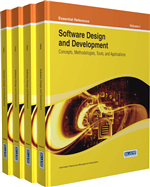 As such, the authors propose their global development software (GDS) methodology emerges as a revolutionary discipline. It is based on the externalization of software development between geographically distant places in order to reduce development costs. Traditional educational and training process in software engineering must be advocated to consider (or enhance) this new trend, with its respective challenges and necessary skills (multicultural interaction, effective communication, distributed software project management), into curriculums. GDS therefore demands the presence of supporting systems to provide permanent user interaction and enhanced communication tasks. The presence of such interactions is a key aspect to promote the performance and knowledge acquisition processes among globally distributed software development teams. The main goal of such interactions into platforms that support distributed contexts is to reduce the impact generated by the tyranny of distance. This work exposes some human-computer interaction (HCI) principles applied by the authors’ research team in order to structure a supporting user interface environment that reflects the distributed computer supported collaborative learning (CSCL) practice in software engineering. The chapter describes several services that are provided for managing the interaction between participants, such as synchronous interactions through Microsoft © LiveMeeting and Adobe © Connect, and asynchronous interactions such as Moodle forums. In this way, the authors implement effective HCI into educational professional practice scenarios for a distributed CSCL within the specialized domain of software engineering. Collaborative learning is a pedagogical framework that has been interested in the study and reflection of the real dynamic of learning (Johnson & Johnson, 1986). It can inquire about the educational interactions because it is supported by cognitive theories: situations in which the protagonists (or users) are acting and interacting simultaneously in particular contexts about a specific task or the learning content, in order to achieve more or less defined goals. The teaching/learning process is determined by communication and the features of the educational context and interpersonal contact in the development of teaching. We propose that the CSCL is characterized by the equality that each individual must have in the process, and mutuality (connection, depth and scope bi-directionality that reach the experience), this variable is a function of an existing competitive level, which involves the distribution of responsibilities, joint planning and exchange of roles (Stahl, 2010). This educational interaction is a prominent feature of collaborative distributed teaching in software engineering, as it seeks out how to provide spaces in which it is possible to develop individual and group skills from the discussions and interactions among the students when they explore new concepts. Each student is responsible for their own learning, generating discussions among themselves when they explore concepts for elucidating, or troublesome situations to be solved. Therefore, looking for the combination of situations and social interactions may contribute to personal and significant group learning. In a modern software engineering teaching and learning process, students cannot learn alone: the auto-structuring activity of the subject is mediated by the influence of others. Therefore, learning is a reconstruction activity of knowledge of one culture and the historical moment (Barriga & Hernández, 2002). Collaboration in the teaching/learning process of software engineering has the ability for enriching and reflecting over the objects of knowledge, increasing the perspectives of analysis and application, ensuring the development of students and teachers as human beings continually in cognitive, social and emotional developing.